Your site is based on WordPress 3.6 or higher. The Groups Newsletters plugin is activated and set up. Your site uses WooCommerce version 2 or higher to handle your online shop. If newsletter campaigns targeted at specific customer groups are desired, you should also have the Groups plugin activated. Go to Plugins > Add New > Upload and click the “Browse…” button to select the plugin’s zip file, usually woocommerce-groups-newsletters-x.y.z.zip (x, y and z are the plugin’s current version numbers). Updates to this extension are installed by deactivating and deleting the old version and then uploading and activating the new version. A new menu item WooCommerce > Newsletters is available on the administrative back end after activating the plugin. Customers can subscribe to newsletters at checkout – This option should always be enabled, as it it the main objective of this extension to provide that feature at checkout. You may disable this option for testing purposes, but make sure to re-enable it if you want your customers to be able to opt-in to receiving newsletters at checkout. Checked by default – This option determines whether the checkbox that allows customers to subscribe to your site’s newsletters is checked by default or not. If this option is disabled, customers must mark the checkbox manually to subscribe to the newsletters. 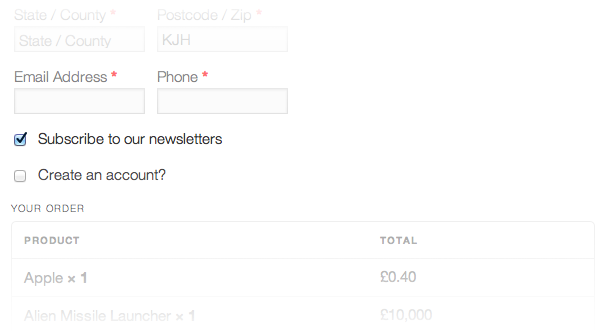 Label – This option determines the text that is shown as the newsletter subscription option at checkout. This should make it clear to your customers that they consent to receiving your newsletters if the option is checked. Click the Save button after making changes to these settings. Customers are given the option to subscribe to your site’s newsletters at checkout. This option is always provided to customers without a user account (guest checkout). For customers with a user account, the option is only provided if they have not subscribed to your newsletters. After a guest has completed checkout, the customer receives an activation email with an activation link to activate the newsletter subscription. The activation email is not sent to customers with a user account.